CFFM is a “not for profit” service and registered charity, aiming to help all regardless of ability to pay. Free mediation is available through Legal Aid if you are on a low income and have limited savings (see separate Leaflet re: Legal Aid). None of the charges apply if you are eligible for Legal Aid. To our Service via the form on our website. A member of our team will then have a brief free telephone consultation with the referrer which can cover your options including, but not limited to, mediation and provide information about court processes etc. 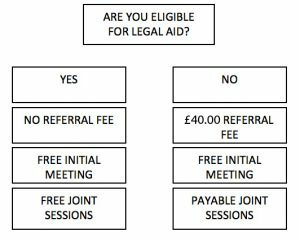 Non-refundable Referral Fee of £40 is payable at this point (this fee can be waived if you promptly send in proof of ‘Passported Benefits’ to us instead – please refer to our Legal Aid leaflet for full details). This fee covers initial administration, telephone calls and correspondence and shows your commitment to the process. We usually write out to, and then talk to, your ex-partner to engage them in the mediation process. We then set up free initial individual meetings which will last about half an hour for both of you to find out more about mediation without incurring any significant costs. You meet together with your ex-partner and a trained mediator in a series of joint meetings. This is usually around 2-3 for children’s matters and may need more for complicated financial issues. You decide after each meeting if you want to continue. Before each joint meeting we ask for part payment as a non-refundable Booking Fee of £50. This is then deducted from your session fee with the remainder paid at the meeting. Note: The first joint session is free for both of you if one of you qualifies for Legal Aid apart from the £50 Booking Fee (later sessions chargeable). 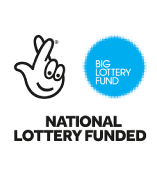 This is free for children’s matters and costs £100 for financial issues. If mediation is not going ahead and you are applying to court then you normally attend a “Mediation Information and Assessment meeting” (MIAM) and have a form completed to show you have considered mediation. 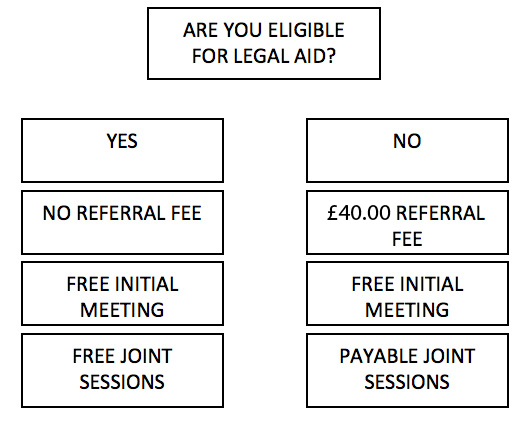 The charge for this is £95 including VAT but again free if you qualify for legal aid. However, if a joint mediation session has taken place then there is a £40 charge including VAT for the service to complete the form. A non-refundable fee of £50 per person is payable in advance by telephone to secure your joint session and then deducted from the session fee. Child only – where they live, arrangements to spend time with each parent etc. Property and Finance – the family home, whether and how it should be sold, maintenance, pensions etc. All Issues Mediation (AIM) – combination of children and financial issues. When we receive the initial referral we will aim to see you for the individual introductory meeting within 2 weeks. The number of sessions can vary. If you are only discussing children’s matters, then 2-3 joint sessions is usually enough to resolve matters. If you are sorting out finances then more sessions may be needed depending on the complexity of your finances. Mediation is usually quicker and more direct than using just solicitors to negotiate for you. In terms of cost, the National Audit Office reported several years ago that mediation average costs were less than a quarter of the cost of going to court with the latter over £2800.